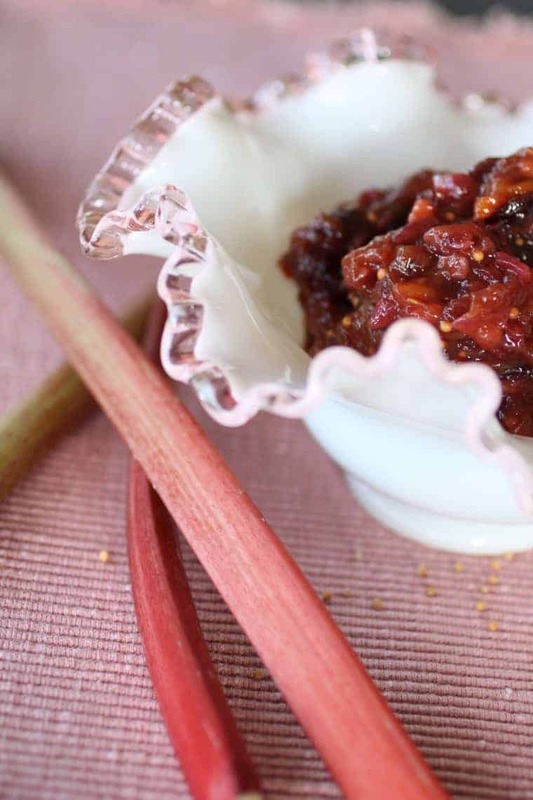 Rhubarb Chutney is a blend of spices, fruit and vinegar. 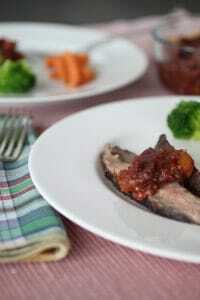 Serve rhubarb recipe with grilled meat, fish and poultry or with cheese. 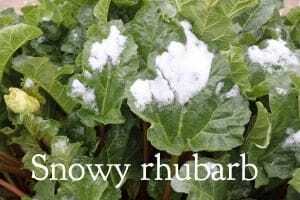 With spring in the Rocky Mountains, about the only thing consistent is that rhubarb is one of the first plants harvested. The plant starts pushing through the ground and unfurling leaves regardless of snow, rain, or sun. Thank goodness we have something to eat in spring! 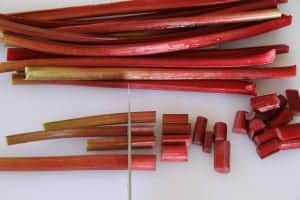 The color of rhubarb stalks can vary from red to pink to light green. The color results from the presence of anthocyanins and varies according to both rhubarb variety and growing conditions. Hot-house rhubarb is usually pink, where field-grown is red. The color is not related to its suitability for cooking, though the more red, the richer in health promoting compounds. If you aren’t able to harvest your own, at the store look for stalks that are crisp and firm. Well-wrapped, rhubarb can be stored in the refrigerator for up to a week and it freezes beautifully. Wash and cut into the size you like to cook with. Store in an airtight container for months in the freezer. Rhubarb is a vegetable that we treat like a fruit. When you cook it, stick to the stalks and leave the big broad leaves behind. The leaves are toxic due to oxaliac acid. The other consistent thing about rhubarb is it’s flavor. It is tart. Not too good on it’s own, cooks use it to add tang to other foods. I love that it can be a sweet or savory ingredient. 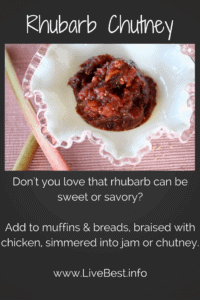 Rhubarb can be diced and added to muffins and breads, cooked into a jam, braised with chicken or meat stews, simmered into syrups or made into a chutney. Rhubarb may react with aluminum, so cook it in a nonaluminum pan, such as stainless steel. I know few people who don’t like strawberry rhubarb pie. I agree that it’s a classic, but consider pairing rhubarb with cranberries, apples, blueberries, blackberries, or oranges. To sweeten try honey, maple syrup, or brown sugar. Cook with sugar, orange, and ginger to make a jam. 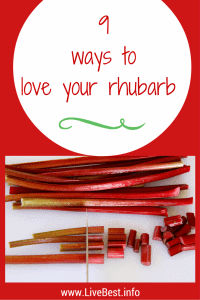 Serve stewed rhubarb over yogurt or ice cream. Blend cooked rhubarb into ice cream base. Simmer sweetened fruit, then drain to create a syrup. Toss raw, diced rhubarb in a green salad. Stir it in barbecue sauce. Or make a chutney. Serve with grilled meats or poultry, on a cheese sandwich or cheese tray. P.S. 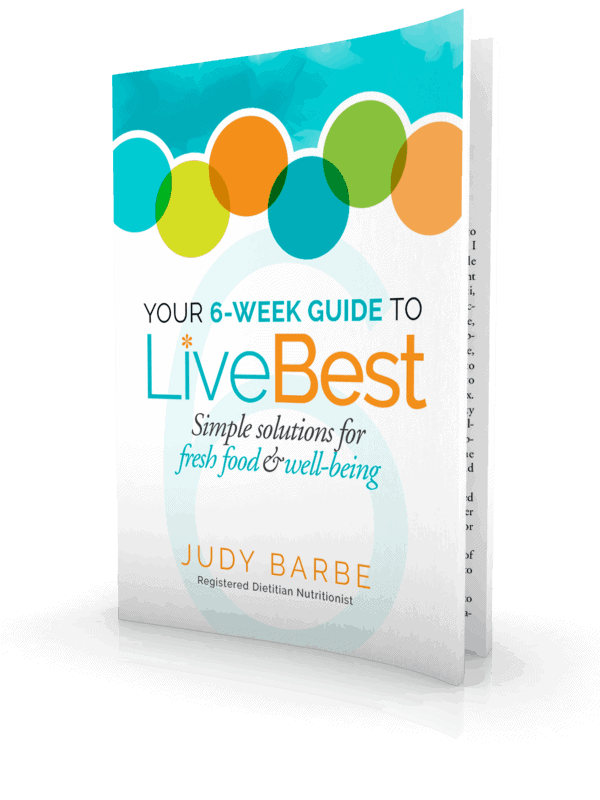 If you want more get healthy tips and recipes? Sign up for my newsletter right here. 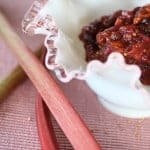 Rhubarb Chutney is a blend spices, fruit and vinegar. Serve this tangy, spicy condiment with grilled meat, fish and poultry or with cheese. Combine all ingredients in a heavy-bottom 4-quart saucepan. Over medium-high heat, bring ingredients to a boil. 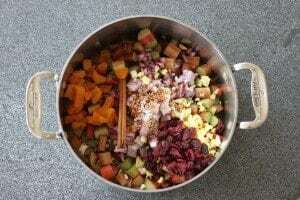 Reduce heat to a low, simmer until chutney thickens, about 20 minutes, stirring frequently. Cool. Remove cinnamon stick. A chutney is best when the ingredients have texture, so don’t chop the ingredients too small.